According to Soccer Laduma report, Messi needs only 14 more goals to become the all-time record scorer. 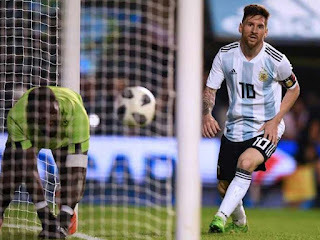 Messi netted a hat-trick in his side’s 4-0 friendly win over Haiti on Wednesday morning, taking his overall tally for the Albiceleste to 64 goals. He has now overtake the record of Selecao forward Ronaldo, who retired with 62 strikes for Brazil. Three-time World Cup Winner, Pele, who sits in seventh spot in the worldwide all-time ranking, is the only South American player to have scored more than Messi. Pele retired with 77 goals for Brazil, which means Messi needs to score 14 more times to overtake the legendary striker.